Polly Polkadot: WOYWW - Back to bad habits. The trials and tribulations of a self employed craft producer living in rural Wales. WOYWW - Back to bad habits. I seem to have lots of un-answered questions from last weeks post for Whats on your workbench Wednesday. So I will try to keep this brief, but I'm sure I will slip into bad habits. Oh good grief - why can't I see the chaos when I'm there, it is only in the photos that I spot it! I am always looking for new ways to display my jewellery, I've even experimented with beer bottles in an attempt to attract / keep more men at my stall. What ever I do, colour seems to be the key. On Saturday Polly Polkadot jewellery will be at RSPB Ynys-hirs annual craft fair. It runs for a fortnight, and I just have to set up my stall and then the staff run the shop and take a commission at the end. So what am I doing with all that fabric? Well, I thought I would make a few bags to go on my stall. But then I realised the shoulder bags are too big. So now I have two stalls at the craft fair: Polly Polkadot jewellery and Polly Polkadot Textiles! Did I buy the cloth labels for the bags? No I decided not to make more than a few bags, and then immediately set about making hundreds! Poor light sewing at night? I don't start sewing until the children go to bed (7pm), so I just have to cope with the lighting! The Pfaff machine? I could probably dedicate a whole blog to my Pfaff machine. My parents bought it when I started my GCSE Textiles at 14 (yep, I am qualified to make a bag! ), and when I left home, they gave the machine to me. Last night saw me with the instruction manual as I could not remember how to make the needle sit on the left hand side of the foot - no doubt tonight I will have to read it again to put it back. Not too long? Well certainly an earlier post than usual for me (OH home sick, so he can look after the youngest whilst I sit at the computer). Wow, not only am I learning about different crafts I'm also learning new words. I've heard of fortnight before - but exactly how long is it? Love the bag!!!! The stripes are very appealing. 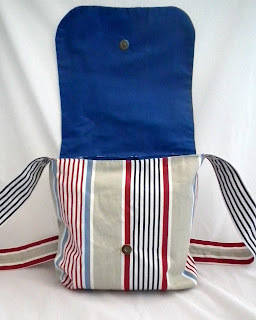 Love the bag, the fabric is great! And so is PFAFF!!! 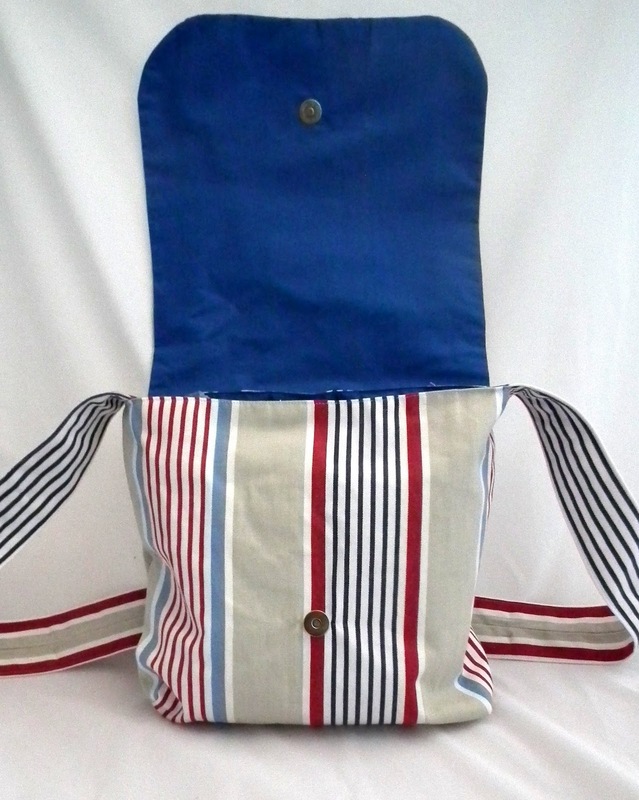 Great stripy ticking - makes a great bag with that blue lining. Very smart! Your machine looks as if it's tough enough to sew anything!! I love that bag. It looks so fresh. I am not sure about Kat's "brute force and wine" working with the sewing machine, they can get so touchy if you don't treat them right! Ha ha, I love your idea of displaying your jewelry on beer bottles to attract men! God luck at the craft fair! Looking at that purse you have made, I am sure you will sell lots of items! You sound like one busy lady. I love the look of those shoulder bags. I have every admiration for you having two stalls. I struggle just having one!! Thank you polly polkadot for the answer on fortnight!! That's a nice bag. I can see it next to your jewelry on beer bottles, which I think is superb salesmanship. Happy belated WOYWW from # 11. I'm a stay at home mum who has to earn an income! I'm self employed during the day, I look after the children and do the housework too. Visit my online gift shop!